Ptolemaic Kingdom - Ptolemy III, 246-222 BC, in the name of Arsinoe II. Mnaieion or octodrachm, 246-241 BC, Alexandria. Obv. Diademed and veiled head, a lotus above, Ξ behind. Rev. ΑΡΣIΝΟΗΣ - ΦΙΛΑΔΕΛΦΟΥ. Double cornucopiae filled with fruits, bound with ribbons. Svoronos 489; Pozzi -. Gold. 27.82 g.
Ex. Collection Peyrefitte, auction Vinchon 29 april 1974, lot 121. 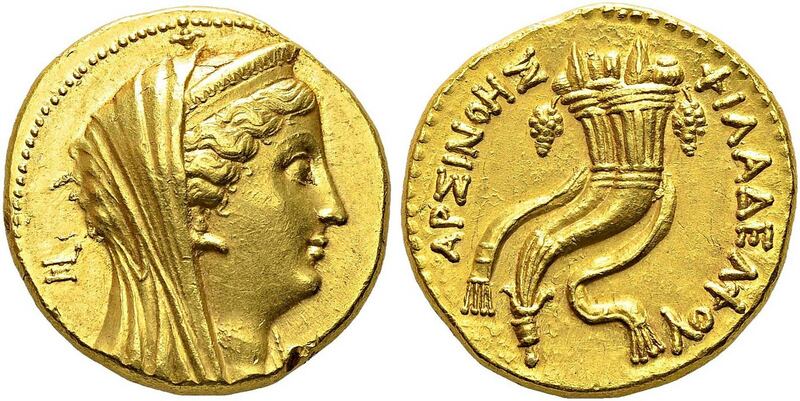 Gold coins in the name of Arsinoe were producted for nearly 150 years after her death. This is why there are a large variety of portraits. 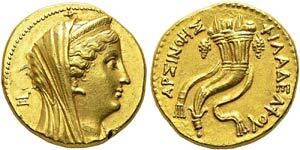 The principal mint was Alexandria which is identifiable by the Greek letters or monograms behind the veiled bust.